What would you do here? 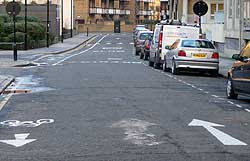 You're a bit east of Tower Bridge, and heading east on Narrow St towards Limehouse Basin (pic 1, right). Well, you'd turn left, obviously, into Spert St. You can see that the road ahead is no entry, and two signs point you left. And you never disobey a traffic sign. Anyway, if you've ridden here before, you know that this is a sort of square-roundabout clockwise one-way system, as in the Google map on the right. Wrong! You're obviously a lycra lout who enjoys knocking over old ladies on the pavement. In fact, you should have gone straight on. 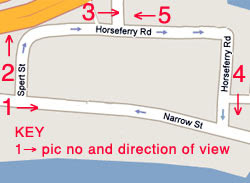 But you carry gamely on, along Horseferry Rd (pic 3, right), not sure whether you should be in the marked-off cycle lane (in which case you're going the wrong way) or just to the right of it (in which case the cars behind you hoot because you're 'not in the bike lane'). Eventually you get near the end of the third side of the square (pic 4, right), where you turn left to rejoin the road you originally left, still wondering what's going on. 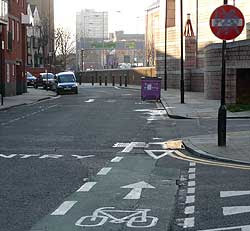 What's happened is that the old one-way system has been made two-way for bikes. Which is good. 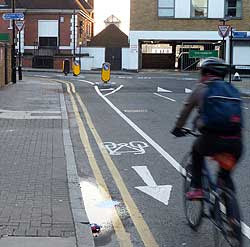 Except it's bad, because (a) it's been done in a confusing way - with bikes being put on the wrong side of the road and (b) half the signage (so far, anyway) is missing. Except that if you do, you're liable to get confused when you see No Entry signs like this (pic 5, right) apparently barring your progress. But every cyclist I saw on Thursday and Saturday last week was still going round the same way as the traffic (quite legitimately, of course), contrary to the contraflow. In other words, the wrong way. Or maybe the right way. Or the wrong wrong way. Or something. I don't know. I have no idea. I don't think the council do either. But let's be optimistic. Good things can come from this. In 1736, faced with the problems of crossing bridges in the most efficient way in Konigsberg, Euler came up with a whole new branch of mathematics to solve them: topology. Maybe that Marcus du Sautoy bloke off the telly could come up with something here to unite String Theory, the Riemann Zeta Function, and where to turn left to find the riverside path. That is absolutely bonkers on so many levels. 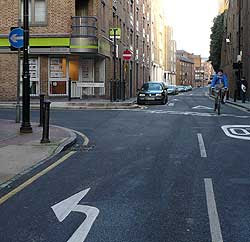 Wouldn't the 'normal' cycle contraflow solution have been to make Narrow Street two-way, so cyclists could take the shortest route? And what could be the possible reason for jeopardising safety and confounding expectations by running the contraflow on the wrong side of the road? The only thing I can think is that this could be a misguided attempt to make the link to Cable Street shown in http://osm.org/go/euu6hJ4Nc-?layers=00B0FTF easier, but I can't see any engineering to suggest this (yet) on your picture 5. By the way, I think that's the Limehouse Link tunnel portal in pic 2, not the Rotherhithe. I'm gobsmacked by how bonkers that is. They really do make it up as they go along, don't they? @Tom... Of course you're right, pic 2 is Limehouse Link tunnel, not the Rotherhithe, as the post originally said. The entrance to the Rotherhithe is round the corner. I've amended the post - thanks. Pretty sure Marcus du Sautoy lives in the Limehouse area - or did until he got the Oxford job. Well, I know he plays footy on Hackney Marshes. I met him once at a college bash. Seemed quite normal for a mathematician. Hardly bonkers at all. I imagine they've done it this way because there's car parking on the other side of the road...still doesn't make much sense though. Why not move the parking bays to the other side of the road? 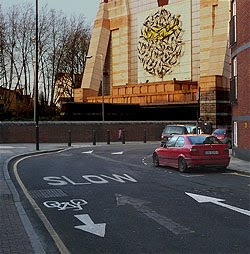 Well, for 2 very good reasons: 1. it'd cost money, and 2. the motorists might get very upset at having to cross the road. Don't you all see what this is? Rob gives a clue early on in his post. This is nothing less than the world's first scientific experiment in revealing the constituent sub-atomic particles of cyclists. Two cyclists colliding should produce quark cyclists - at least they won't be able to ride normally after colliding like that. 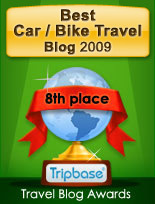 A cyclist colliding with a car should theoretically produced a boson (or at least prove that there are 'bozo' drivers). The whole set-up is designed to produce something quite surreal, and may in fact create, even for a millionth of a second, conditions similar to that in Copenhagen. Have you never heard of the the Heisenberg uncertainty principle, formulated at the Niels Bohr institute in Copenhagen? It states that certain pairs of (sub-atomic) physical properties, like position and momentum, cannot both be known at the same time. Look at that junction! If that doesn't prove the uncertainty principle, nothing does. Maybe. "Mind you, this is Tower Hamlets, home of the Glamour Ride: they sometimes do have strange ways here..."
The secret was in the cyclist contra-contraflow part, hinting at the possibility of a cyclist colliding with an anti-cyclist, which at high enough energy can result in a microscopic black hole of carbon fiber, from which nothing but hyper-particles called Contadorinos can escape. @Betty... but of course. 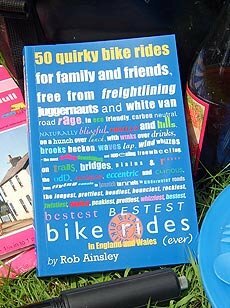 The Glamour Ride is an excellent thing and I'm totally in favour of it, as I hope my previous posts on it make reasonably clear. Ditto our chums in Tower Hamlets Wheelers. You can tell by the tone of voice on my face. This is the way we like to do things in Tower Hamlets - this, and carefully orchestrated gang violence and knife crime help to keep our rents cheap and the area from being over sanitised by infiltrating West Londoners. You've got to have some true anarchic principals to survive a traffic scheme like that, whereas all you 'outsiders' will just follow the signs round and round before you disappear down the tunnel and pop up on the other side far away from us. Don't you see the genius in our plan?! I live in one of the flats directly opposite your last photo, my balcony overlooks where the new contraflow cycle lane crosses the junction on Horseferry Road with Branch Road (traffic heading at speed south from Commercial Road). There are NO signs warning motor traffic of the cycle contraflow crossing their path (the 'wrong' way) at the T junction. In the 6 months this scheme has been running I have witnessed at least 3 bike vs car accidents, and so many near misses I have given up counting. Cars that do not know the area have no idea there are bikes crossing their path (left turn only, so they assume they only need to look right, and miss bikes approaching from the left). If you travel this route, beware!